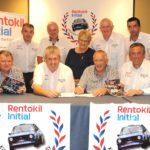 The Rentokil Initial Killarney Historic Rally takes place on Sat 1st December and is recognised Internationally as Irelands premier Historic Rally. It attracts a huge amount of quality competitors every year and is Ireland’s only event to cater solely for historic rally cars. It is included as counting rounds of the Irish Tarmac Rally Championship, The Kingdom of Kerry Rally Championship, The British HRCR Rally Championship and The Plasticbags Southern 4 Rally Championship. The Event is expected to attract over 150 crews from all over Ireland, the UK and indeed Europe.